A telecentric lens is a compound lens that has its entrance or exit pupil at infinity; in the prior case, this produces an orthographic view of the subject. This means that the chief rays (oblique rays that pass through the center of the aperture stop) are parallel to the optical axis in front of or behind the system, respectively. The simplest way to make a lens telecentric is to put the aperture stop at one of the lens's focal points. If both pupils are at infinity, the lens is double telecentric (or bi-telecentric). The apparent size of objects changes with distance from the camera. Some features or objects may be hidden by objects that are closer to the lens. Telecentric lenses, on the other hand, provide an orthographic projection, providing the same magnification at all distances. An object that is too close or too far from the lens may still be out of focus, but the resulting blurry image will have the same size as the correctly focused image would. Because their images have constant magnification and geometry, telecentric lenses are used for metrology applications, when a machine vision system must determine the precise size of objects independently from their position within the FOV and even when their distance is affected by some degree of unknown variations. These lenses are also commonly used in optical lithography for forming patterns in semiconductor chips. Object-space telecentric lenses have an entrance pupil infinitely far behind the lens; that is, if one looks in the front of the lens, the image of the aperture is very far away. Telecentric lenses tend to be larger, heavier, and more expensive than normal lenses of similar focal length and f-number. This is partly due to the extra components needed to achieve telecentricity, and partly because the object or image lens elements of an object or image-space telecentric lens must be at least as large as the largest object to be photographed or image to be formed. 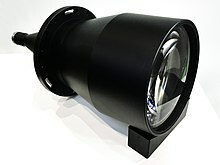 As of 2006[update], these lenses can range in cost from hundreds to thousands of US dollars or euros, depending on quality. Because of their intended applications, telecentric lenses often have higher resolution and transmit more light than normal photographic lenses. An image-space (or image-side) telecentric lens produces images of the same size regardless of the distance between the lens and the film or image sensor. This allows the lens to be focused to different distances without changing the size of the image. Image-space telecentric lenses have an exit pupil infinitely far in front of the lens; that is, if one looks in the back of the lens, the image of the aperture is very far away. Since the ray cones approaching the detector surface have the same angle of incidence and angular subtense everywhere in the image plane, the image is evenly illuminated. This feature is commonly used in photography and is very useful for radiometric and color measurement applications, where one would need the irradiance to be the same regardless of the field position. Lenses that are double-telecentric have magnification that is more precisely constant than those that are only object-side telecentric, because the principal ray intercept position on the detector does not change. This property allows precise measurement of objects regardless of position. ^ "Telecentric Lenses: basic information and working principles". Opto Engineering. Retrieved 14 Oct 2008. This page was last edited on 1 August 2018, at 21:40 (UTC).